Home » Caddie or Caddy – What’s the Difference? Homophones are words that are pronounced similarly but have different meanings. English is full of such words, and they are often confusing for writers. Caddy and caddie are homophones that can never be substituted for each other, even though many writers try. So, which one is which? What is the Difference Between Caddie and Caddy? 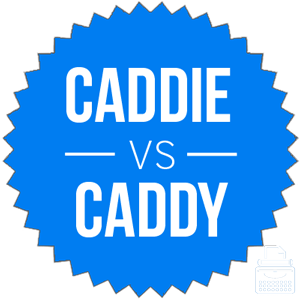 In this post, I will compare caddy vs. caddie. I will use each of these words in at least one example sentence. Plus, I will show you a helpful memory tool that you can use to make sure that you use either caddy or caddie correctly in your own writing. What does caddie mean? Caddie is a noun and refers to someone who carries golf clubs for a player, especially for hire. It has two related meanings, both of which are related to golf. “You need a caddie to help you manage all those clubs!” said Jack Nicklaus. Caddie was originally a Scottish term for someone who does odd jobs. Many of these odd jobs involved carrying golf clubs for sportsmen, so the term eventually evolved to be specific to golf. What does caddy mean? Caddy is also a noun, but it refers to a box or other container, especially one that contains tea. Caddy was first used in English around 1785, where it comes from a similarly pronounced Malay word. It is likely that caddy traveled to the English-speaking world with the tealeaves that were shipped from Southeast Asia by the British East India Company in the 17th and 18th centuries. Margaret stored her tea in a small glass caddy in the pantry. My sister asked for a wooden tea caddy for Christmas. The plural form if caddy is caddies, which adds to the confusion between these two words. Some people call small tool boxes tool caddies. Writers will occasionally use caddy when they really mean caddie, but this usage is a mistake. Even though caddy and caddie are homophones, they are not interchangeable. Use caddie in the context of golf. Use caddy when referring to tea. Caddy vs. Caddie Check: Since caddie and birdie are both golf terms that end in -ie, it should be easy for you to remember that caddie refers to a way to carry clubs. Is it caddie or caddy? Caddie and caddy are homophones that are both nouns. Caddie refers to a person or bag for carrying clubs, while caddy is a box for storing tea. Don’t forget, they are not interchangeable, so you will need to keep them straight with a mnemonic in your head. 1 What is the Difference Between Caddie and Caddy?